"State capture" is defined as the efforts of individuals or firms to shape the formation of laws, policies, and regulations of the state to their own advantage by providing illicit private gains to public officials. The key distinction in this typology is not, for example, the size of a bribe nor the level in the political system where bribery occurs, but rather whether the corruption is directed to distort the intended implementation of laws or to shape the formation of the laws themselves. 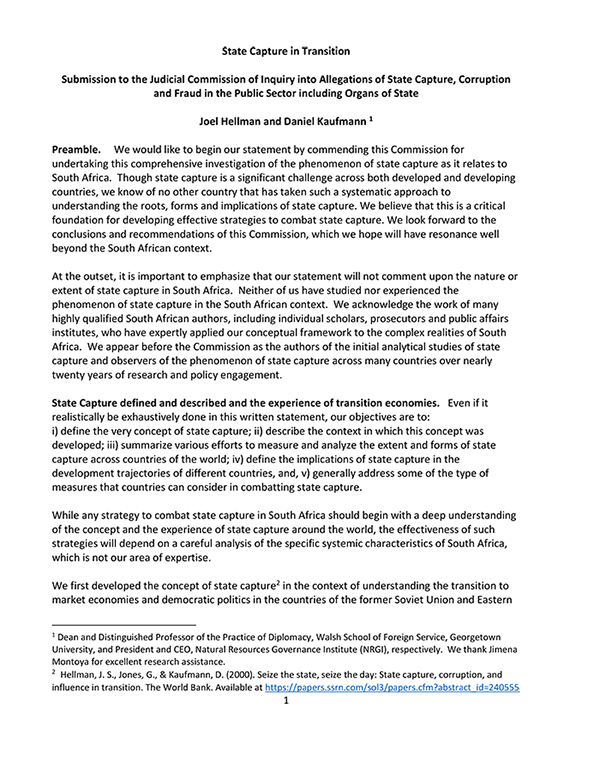 This page hosts the work of NRGI experts on state capture and its effects, along with news coverage of such work. At this University College London Global Governance Institute lecture on 5 March, Kaufmann will address a series of questions: What does the evidence show about trends in governance and corruption around the world? How costly are mis-governance and corruption, and which particular manifestations pose a major threat in the current context? Is corruption in reality becoming “legalized” in many settings? What is state capture, why is it so costly and what can be done about it? Are some sectors—such as natural resources—and countries particularly vulnerable, requiring special attention? What could constitute the central elements of approaches to good governance and corruption control in the future? Recent corruption scandals have shown the negative effects that corruption may have in countries around the world, including those of the Latin American and Caribbean region. The Inter-American Development Bank has therefore convened an independent group of experts composed by eight governance and anticorruption scholars and practitioners to identify innovative and effective approaches to combat corruption in the region. (NRGI president and CEO Daniel Kaufmann is one of them.) Drawing on the members’ decades of experience, this report analyzes the key features of corruption in the region and proposes an ambitious agenda toward more systemic transformation. The report targets a series of measures aimed at strengthening the rule of law and public institutions, addressing state capture and helping to meet citizens’ aspirations for sustainable and inclusive development. Hence, the report recommends a multi-layered approach that requires collective action by governments, the private sector, civil society, and international institutions to tackle the roots of corruption and capture through global, regional, and domestic initiatives. Kaufmann presented a lecture on the changing nature of corruption around the world, based on data and experience. In discussing the implications for reform, he emphasized one of the most important forms of "grand corruption"; namely, the challenge of state capture. Watch the lecture. Kaufmann also gave an interview with Tonight with Jane Dutton. Kaufmann delivered testimony in Johannesburg at South Africa's "judicial commission of inquiry to inquire into allegations of state capture, corruption and fraud in the public sector including organs of state," focusing on global corruption. Watch a replay of the testimony. Business Live and African News Agency covered the testimony. Kaufmann spoke with South African 24-hour news broadcaster eNCA following his testimony to the commission. Watch a replay of that interview. Kaufmann delivered a public lecture on the changing nature of corruption based on data and experience in Kiev the Good Governance Forum, a conference organized by Aspen Institute Kyiv. Watch the presentation. Kaufmann, in tandem with Georgetown University School of Foreign Service Dean Joel Hellman, provided testimony on state capture on the eighth day of proceedings of South Africa's "judicial commission of inquiry to inquire into allegations of state capture, corruption and fraud in the public sector including organs of state." The Institute for Security Studies and South Africa’s The Citizen covered the testimony. Read Hellman and Kaufmann's written submission to the inquiry and watch their testimony. A transcript of the testimony is also available here. Kaufmann delivered the keynote presentation at “Transparencia: Open Data and Anticorruption in Latin America,” at a 2016 symposium at Harvard University. Kaufmann offered a framework to rethink and redefine the conventional view of corruption. Showing global evidence, he addressed various governance dimensions that matter and their impact on growth and development. He talked about the challenge of “state capture” and of “legal corruption,” among other topics. Legal corruption is in the spotlight after the massive data leak on offshore companies known as the Panama Papers, which his presentation also covered. NRGI advisor Alexandra Gillies and Kaufmann write that it is vital to distinguish between legal corruption (such as that exposed by the Panama Papers) and illegal corruption (such as that exposed by the Unaoil scandal) and recognize that this is a moment for governments to take decisive action against both.